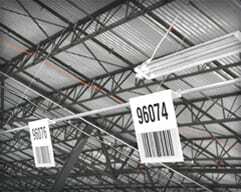 Barcode license plate labels, are a crucial item for the management and accurate handling of pallets in distribution centers. Hundreds of pallets might be processed through a single distribution center every day, so identification is very important. 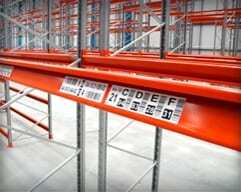 LPN labels are often the primary identifier in a FMCG facility, or a secondary check item in others. The labels are sequentially numbered and can be used as single tags or dual labels which wrap around a corner making them a single application label, visible from two directions. We use cost effective materials which are ideal for industrial grade consumable labels, in addition, we utilize high speed, high definition print technology to minimize production costs, while maintaining barcode verification rates and high clarity visual displays. 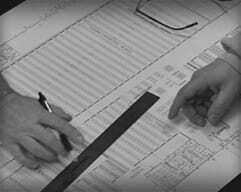 There are several product format options depending on your operational needs as follows. Singles – These are simple rolls of sequentially printed barcode labels, available in most sizes. Single Twins – We can supply two identical labels which sit next to each other on the roll or one after the other. These are popular with companies handling smaller pallets, crates and/or cartons. Single Dual – A label which has two sets of content per label. They can be wrapped around the corner of a pallet and are typically ordered sequentially. Dual Twins – a label with two sets of content and presented with an exact copy next to it on the roll. 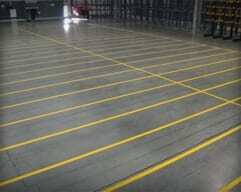 Popular in large distribution centers handling large pallets as only two applications label four sides of the pallet. Supplied as die cut labels in single, dual and with twin layouts, depending on the sizes required. These can be produced quickly with excellent barcode quality and variable color options. A common request for custom LPN labels is for color, color variations, content dynamics and material durability. A flood coated color label will be easily found against a pallet load of boxes, additionally, the color of the label might also denote the quarter in which the pallet was accepted into the building, which customer it is for or something equally as significant to your operation. 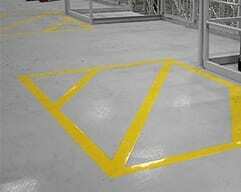 We also have access to a huge range of materials, so if you have a particular application need or surface difficulty, please ask us what we have available. If it’s not on the shelf, we’ll find the appropriate product to service your need. 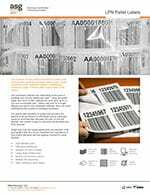 As a supplier to many large organizations, we have developed ways to manage the supply of large volumes of sequential barcode labels, so customers never run out. We can hold stocks of your LPN labels, or arrange scheduled production dates so a shipment is always readily available for your order. To discuss the options, services and support, please feel free to contact us. We’ll be happy to discuss your LPN label requirements. Email your questions and we'll respond with suggestions, pricing and anything else to help with your decision. Feel free to call and ask questions, we understand there is a lot to know and we're happy to help.